Max 2 guests / 1 Car. Please avoid leaving a "Single Night Gap" May- Sept. & Spring Break. Summer 2019 July & Aug 5 nt min. Holiday weeks may have min nt stay and higher rates. Memorial Day & Labor Day Weekends 3 nt. Min. "Anchor was just as described on the website. Clean and stocked well enough for the two enough. The view was incredible and we saw a number of whales over the course of our stay. We had damp and dreary weather while there, but Anchor was cozy and warm each time we returned. We’ll definitely return again. " "The room was very clean and the perfect size for a couple. The view was incredible. Its location high up from the beach allowed for some excellent whale watching (it's migration time). Bring your binoculars or a good telephoto lens for your camera. Our first morning we awoke to whales breaching straight out from the house, with some very close in by the rocks. We watched for hours. This was clearly the viewing spot that day and about a dozen boats converged around the area over next few hours. Plenty to do in the area. Only (tiny) complaint is the hot was really over-treated, but there was plenty of other things to do there. We'll definitely be back." "We have stayed here before. It is great for 2 people. Really clean. Rates are reasonable. The view is amazing! Quiet. We messed up the T.V. Messaged A1 Beach Rental and they had someone right out to fix it." "Perfect little rental for our anniversary! Clean and spacious! Loved the wood accents on the walls and roof, paired with the stove it was romantic and homey. Such a great view from the bed and especially loved the private hot tub! We will definitely be back, alone AND with family to share the other side of the house with! Thanks for sharing your home with us!" "Wow, what a view! The best view on the coast. We were able to see whales, seals, sufers, and all kinds of sea life, from the comfort of our private hot tub, or even the comfort of our bed. The room is perfect, clean, and comfortable! Customer service was top notch. We will be back! " "Anchor was amazing. The view was beautiful and my husband and I watched the Whales from the hot tub. Definitely will stay again." "A studio apt with its own patio and jacuzzi"
"My wife and I have stayed at many places along the coast, mostly hotels and mostly in Lincoln City. This was so far beyond any previous place that theres really no comparison. The view is absolutely amazing! The access to the beach is excellent, as long as you dont mind a lot of stairs. Hot tub is a really nice way to end the evening. The room itself is more than spacious and very comfortable. Parking is great. Privacy is great. We had a wonderful time and this will definitely be our go-to place from now on." Manager Response: So glad you enjoyed the Anchor! Please visit again soon! "Amazing view and location. We loved our stay and will be back again!!" Manager Response: So glad you enjoyed the Anchor! Come visit again soon! "Easy booking, check-in and check-out. Our unit was clean and looked exactly as the photos posted on line. Only 2 suggestions I would offer: 1) a small dresser to store non-hangable clothing would be nice (could fit under the window next to fireplace) 2) Update the paper work inside the unit, as one area says to strip the bed, another on the fridge says not too. A bit confusing, but we referred back to contract and followed those instructions. " "I was very happy with our stay at this rental. Small, cute and perfect for a couple.. my husband I enjoyed our stay.. we never got to enjoy the hot tub (which is sad), but maybe next time! Beautiful location and area! Would definitely stay here again! " Manager Response: Thanks so much for staying! Glad you had a good visit at the Anchor! "Cozy nest with oceanfront hot tub, what more could you ask for?" Manager Response: Great to have you stay again! "Would def come to stay again and highly recommended for lil quiet romance." Manager Response: Glad you had a good stay! Visit again soon! "We enjoyed our stay at this cozy little beach house ?? Was very clean and comfortable, the hot tub was great and the views beautiful! Would definitely stay there again." "The studio was clean and quaint. Had all the things we needed for a short weekend stay. The view was absolutely stunning and the hot tub over looking the ocean was well worth the stay. The only drawback was check out was 11 and the cleaners and pool keepers showed up about 10:50. Maybe showing up at 11:30 would be better? All in all we will be back!" "My wife and I really enjoyed the experience of staying in the beach house! The place was very nice and well kept!" Manager Response: So glad you enjoyed your time at the Anchor! Please come again soon! "This is the PERFECT little spot of heaven for a couples getaway. We didn't make it down the steps to the beach but that's only because of the storm that was going on. Great views for that though, right from your room. We can't wait to go again." Manager Response: Glad you enjoyed the stormy weather. Please visit again soon! "Everything about this place was beautiful. It was very nice inside and the view made it the perfect get away. The only thing that bothered me was that the shower would not get warm and one of the chairs at the table was broken. None of that would stop me from coming back again though. It was seriously a dream come true for me and my girlfriend I am thankful we got to spend our weekend together in that beautiful house." "This was our getaway for our first anniversary and it was a wonderful place to spend it!! The place is very quaint and cozy. Love the gas stove. Perfect ambiance. Perfect view. We had an amazing time!! Thank you !! " Manager Response: Really glad you enjoyed your stay at the Anchor! Please come again soon! "A1 was clean and gorgeous. It had all the amenities we could have possibly hoped for and was in an ideal location for a relaxed time. We will be coming back for sure." Manager Response: Thanks for your review! Please visit again soon! "LOVE IT HERE! We have stayed before and will stay again! Perfect place for 2! Love the view...the private hot tub...the beach access. Couldn't get much better!" Manager Response: Thanks for your kind review! Glad you enjoyed the Anchor! Come again soon! "My wife and I really enjoyed our stay at Anchor house. The views and location were outstanding. The app provided all the information we needed for our stay and was user friendly as well. The only small disappointment was the hot tub. When we arrived it had been essentially unplugged and was cool when we chose to use it our first night. I figured out how to get it to start, but directions weren't provided. I also think a little more attention to the chemical levels were in order. This was or first trip to Lincoln City and we liked everything about the town except the dining options. There is room for a small apartment sized stove in the kitchen and it would make a great, inexpensive addition. That said, we knew it didn't have a kitchen when we rented. Manager Response: So glad you enjoyed your stay at the Anchor! Please visit again soon! "The place was great, perfect for two people." Manager Response: Thanks for staying at the Anchor! Please come again soon! "My wife and I really enjoyed our four day stay at Anchor. The property description was very accurate and there were no surprises. It was an ideal size for us, small but cozy. Great views from the deck and a great location. The owners provided more than sufficient about the area (restaurants and attractions). We also loved the neighborhood that Anchor is located in." Manager Response: So glad that you enjoyed Lincoln City and the Anchor! Please come again soon! "The anchor rental was everything we had hoped for and more! " Manager Response: Thanks for staying at the Anchor! Visit again soon! "The best ,I wish there was a discount for returing stays,this was I think my 5th time.Loved it though,great for two people.Very clean and cozy." Manager Response: So glad to have you! Please come again soon! "We absolutely loved the Anchor and will definitely be back. " Manager Response: So glad that you enjoyed your visit at the Anchor! See you next time! "We had a lovely time and the rental was as promised, except for the bed. The bed needs a new box spring and frame." "We had a great stay. Property was clean and cozy. View was amazing. Everything was just as described. We enjoyed walks along the beach, soaks in the hot tub over looking the ocean and sight seeing around Lincoln City. We would definitely stay here again. Would love to bring the rest of the family and rent Anchor and Submarine. " "This is the second time my wife and I stayed at this location. We loved it again. " "The Good: nice small place, exactly what we were looking for, on the beach, private hot tub. Almost everything was perfect. The Bad: the bed was really worn out and very uncomfortable! We would absolutely stay here again if the room was given a new bed." "We had a great time at the Anchor. We loved the fact that it was right on the beach and had private access to a hot tub overlooking the ocean. There were steps that lead you right down to the beach. The weather turned out to be perfect for our trip. Inside the rental everything was stocked as needed and there was a fridge, microwave and such for our use if we needed it. We will definitely stay here again and recommend to friends and family." "The unit was very true to the pictures that we reviewed before renting The Anchor. It was quiet and romantic. The hot tub overlooking the beach/ocean was perfect. The Anchor was very clean. We enjoyed shopping, eating at Mo's and Kyllo's. I would recommend The Anchor if you want a quiet romantic place to spend a few days." "The storms were awesome we couldn't have picked a better day to go over"
"We love the view, privacy, and the hot tub. The room is very appealing too. This is our 2nd stay for our anniversary. See you next year!" "Overall the property was well cared for, and in a great location. The major issue that we had was with the hot tub. It was turned off and cold when we arrived, and it took over 8 hours to heat up. There were not any instructions as to what to do to get the hot tub working. We had to find the breaker to turn the power on before we could start heating the water. Once it was hot, it was great. The gas stove worked well and really heated the room. It would have been good if some soap was provided for the shower. " "The Anchor was the perfect 3-day getaway for our 20th Anniversary. It was immaculate and had everything we needed. Even at the end of December we had the perfect day, starting with watching a large group of whales from the hot tub with our morning coffee, hitting all the beautiful scenic points South to Yaquina Bay, back in time to explore the endless tidepools at low tide, and then cocktail hour back in the hot tub for an amazing sunset. Day two was another perfect day but this time relaxing with DVDs and storm watching. We just wish we were able to stay longer and we will definitely be back." Manager Response: So glad you enjoyed the whales! Please come again soon! "A lovely studio with kitchenette. Take heed, there ARE 90 steps and a ladder to and from the beach. The home is in a quiet neighborhood and has a fantastic view. We enjoyed our stay so much we're thinking of reserving Submarine for a winter stay with our family." "The Anchor definitely met our needs. Clean, great view, great proximity to the ocean. Hot tub was clean and well functioning. Place is cozy with the gas fire place. "My first time to the West Coast, this property was perfect place to stay! Had a small issue with hot tub, staff was there 20 min after phone call and fixed problem! Perfect location, excellent views, clean, everything we needed was there! Would absolutely stay again!" "Great little place, beach access and wonderful view. Good condition, clean and well maintained room. " Manager Response: Glad you enjoyed your time! Come back again real soon! "The studio was clean & nice! The view was breath taking, the hot tub was relaxing, the deck was inviting, all around greatness!!! The stairs were a bit of a workout, but worth the steps!!! It was a great few days! We loved it!!!" Manager Response: So glad you enjoyed your time at the beach! Come back again soon! "What a perfect little place for two! 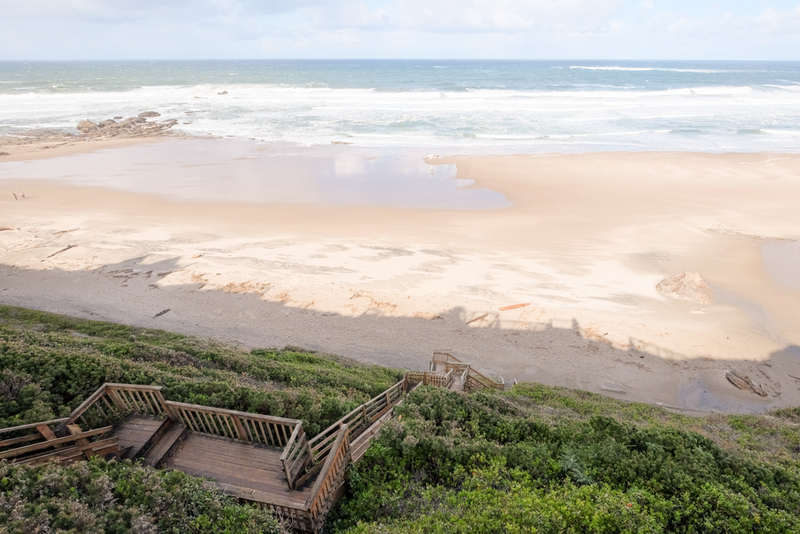 Access to a very private beach area from the stairs along with two beautiful days of sunshine made for a memorable stay." "This was the best beach stay we've ever had. Everything from the cozy fireplace, whale watching each morning (we were able to see four one morning! ), the private deck and hot tub as well as beach access was wonderful. The room was super clean and had all the amenities we needed. " "No surprises and a clean room! Our stay went well. It was exactly what we were looking for in a house on the beach." Manager Response: Thanks so much for staying! Please visit again soon! "We traveled to Oregon from San Jose to attend Finders Keepers Glass festival in Lincoln City. Although the weather did not cooperate we still had an enjoyable weekend with breath taking views of the Pacific Ocean and easy beach access. The fire place was a nice addition, the only negative was the bathroom shower which was difficult to get a consistent temperature." "it was very clean and we didn't have any problems at all!! We can't wait to stay there again very soon! Lots of things to do and places to eat all very close. " "The best part of being at the anchor was feeling at home and relaxed after all that fuss and family that a wedding brings. My wife and I had the most amazing connecting experience at your rental. We even manage red those stairs to the beach! Thank you for a great stay. " Manager Response: So glad you enjoyed your stay! Please come back again soon! "We stayed in the Anchor condo for our honeymoon. We greatly enjoyed our stay there and were able to see whales out the window and from the hot tub! Would definitely go back!" Manager Response: So glad you saw the whales! Come visit again soon! "We stayed for along weekend when we were site captains for the SOLVE beach clean up. This has to be one of the best places for two people in the city. The view is fantastic. We saw several whales out our window. I would difinity stay here again! " "Absolutely loved it! Clean, quaint with an amazing view! Already thinking about our next trip... Will definitely stay here again!" Manager Response: Thanks so much for visiting! Please come again! "This is a charming unit as close to the water as you can get, with amazing views. There's not a full kitchen, but we hadn't planned on cooking, so that turned out all right. The heat worked well, as did the hot tub. Would def consider coming back." "We love this place. Stayed the first time a few days ago and will definitely be back. Everything from renting to giving the keys back was perfect. Love the App and check out. Very clean and quiet and had all necessities. Thank you for starting great memories!!!! We will be back!!" "The room is small, but the view from the room and hot tub are nice. The bed is a little soft for my taste." "The Anchor was our destination for our 41st Anniversary. We not only loved the cozy condo and the view, we actually took the stairs to and from the beach twice! Thanx for sharing your space with us." "The room was perfect for 2 people. We loved the fact that was surfacing going on just out side our window. The weather was perfect, clear blue and warm (60*). We've recommended the room ot a number of people. The house was easy to get to and nicley remodeled. "The Anchor is a perfect getaway spot. It is private, relaxing, and beautiful. The place was impeccably clean and welcoming. We enjoyed sitting in the hot tub and watching the waves as well as taking stairs strait from the back deck to the beach. There were many surprise bonuses like cable tv and free wifi. Great location, highly recommended. We have already decided to come back as soon as we can. " "The room is plenty big for two people, the view of the beach was beautiful. The stairs down to the beach can be a workout but it was really fun. The bed was a little soft for my taste but otherwise very comfortable. The only thing negative I would say is there is no stove or dishwasher but they do have a plug in skillet that was a good substitute for cooking eggs and bacon. Overall, 5 stars!" "My wife and I had a great time! We hunkered down and watched the storms from our room, spent a couple hours sitting in the hot tub when it wasn't too stormy, and over all had a very romantic get away. It is connected to the main part of the house, but had no issues with privacy. Nice place!" Down pillows and comforter would have been nice, a larger foot stool (for 2) in front of the sofa, a better shower head, and a toaster oven. Still...a great getaway for my guy and I. We are sure to come back in the summer!" "The property was beautiful, clean, tastefully decorated, and a perfect romantic get-away destination. The owners even have pilsner glasses chilling in the freezer for the guests--what a nice touch! The water pressure in the unit was great, except in the shower, the shower head could be updated. That was the only inconvenience, and a mild one. This is a place we will definitely return to!" "Our vacation experience at The Anchor was so much fun! Had an amazing view, good weather, very clean and overall a great place to stay!!" "I thoroughly enjoyed my stay!" "This is a beautiful rental... Very clean! The location is great and the access to the beach is wonderful. We loved the tide pools right in front of the house. This is a quiet location and seemed very safe! Couldn't have asked for a better stay! " "We absolutely loved our experience at The Anchor. The room was nicer than we expected and perfect for two. We loved seeing and hearing the ocean no matter where we were inside and the private deck & hot tub were awesome! A lot of people say the stairs are difficult but we didn't think so at all. We were up and down them several times. The beach was great... almost all to ourselves. There is so much to sea life we were able to observe at low tide out in the rocks. We also spotted some whales right from the hot tub. And a short walk down the beach allowed us to see the Harbor Seals. We can't think of any place that would be better to stay than The Anchor. We celebrated our 25th anniversary there and we're already planning our next trip to stay again." "We spent 3 very enjoyable nites in the was very comfortable and even when the weather wasn't so nice outside it was cozy inside with the gas fireplace.Loved the view from the room." "Loved the location and perfect size for 2. The hot tub overlooking the ocean was wonderful and we were very happy overall. Our only complaints would be the very outdated and terrible shower head and needing more towels, since we would rinse off before and after each hot tub visit. " "The Anchor exceeded expectations! The view and access to the beach was amazing. It was a very quiet, cozy and romantic setting. We will definitely be coming back! " "MY SECOND TIME AT THE ANCHOR & IT WAS JUST AS RESTFUL & COMFORTABLE AS I COULD USE A NEW SHOWER HEAD, BUT OTHER THAN THAT THE ROOM WAS AWSOME! BEAUTIFUL...BEAUTIFUL VIEWS!" "We finished up our honeymoon at the Anchor and it was absolutely wonderful. Very romantic and private and would definately stay here again! " "We love this place and have stayed there twice. The TV is a little small... but the great view makes up for it! The shower does have a little leak that can be a little annoying but if you shut the bathroom door it is not noticeable." "Awesome location. Gorgeous both inside and out. Only complaint would be the cleanliness. Under the bed and under the table next to the fridge were very dusty. The light fixtures in the bathroom were also very dusty. Along with the sliding glass window tracks were gross. Other than that, I loved it. Comfortable, cute and breath taking views! Overall I just say have your house keeper look and clean slightly better :) "
"My boyfriend and I recently stayed at the Anchor and we wished we could have stayed longer. The studio is adorable and had everything we needed. The deck and hot tub were our favorite part. We walked down the stairs in the morning for low tide and saw all the star fish in the rocky cove just left of the house. Very satisfied with the place and would love to return again." "We had the best time! The guest house was clean and neat with everything that you need for your stay. The only negative was the shower head. It was horrible. The hottub was perfect! The ideal spot for viewing the ocean. No wind at all. " "Just what the Dr. Ordered.."
"It's a breath taking view above the ocean in a cabin. PERFECT FOR A ROMANTIC GET AWAY." "It was truly amazing. We couldn't have been happier with our stay. The view was spectacular and the hot tub was the topper." "It was what we were looking for. Great view of the ocean with a hot tub and fireplace. Nice beach access. We really enjoyed our time there and will do it again." "I want to give this place a bad review, just so others don't stay here. It was so cozy and perfect. The best romantic getaway. Loved how warm it was inside and loved using the hot tub. The stairs to get down to the beach are step but worth taking down! Would definitely stay here again!!" "The room was very cozy and exceeded our expectations. Everything felt neat and clean, and it took no time at all to feel comfortable and relaxed! Although there is no stove, there was a hotplate that worked really well. The view was really incredible, especially from both the deck and hot tub. The only downside was the windows would fog up during the mornings and nights. We will definitely be back!" 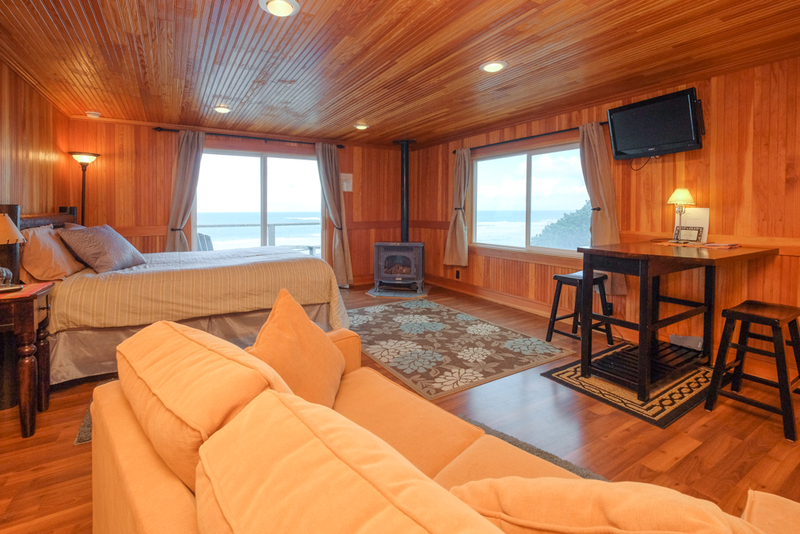 "The Anchor is a cute, quaint little studio cabin, with a view, a deck and a private hot tub. Made for a great place to celebrate my birthday. It had everything we needed. Peaceful, quiet. Bed was very comfortable, linens were nice. The little gas stove gave so much character to the room and kept us at the right temperature. TV, cable and WiFi if you need to stay caught up. Definitely will return to this one. Also, A1 Beach Rentals is so great to work with. They are always available to answer questions and checking in and out is a breeze. Thank you for another great get away. " "We had a really awesome time staying at this rental. It was beautiful inside and the views were stunning! It's a little weird sharing the property, but not too bad. Everyone was polite and we had our own private deck and private hot tub. The bed was super comfortable and we enjoyed our stay very much! Thanks and we would definitely recommend this place to others. The only issue was a few people who were not renting the property using the private beach access stairs." "My husband and I stayed 4 nights at the Anchor in July. The suite is charming and clean, and although it does not have a full kitchen, there were enough small appliances to make due (coffee machine, toaster, blender, hot plate). The suite was very clean; the bed comfy (although a little soft for my preference); and the view really was spectacular! There are 121 steps down to the beach (yup - we counted them) including an aluminum ladder for the last few...not sure if the ladder was mentioned in the description of the suite. Just a couple of suggestions - the showerhead in the bathroom was VERY weak - perhaps its time for a new showerhead with more power. There are no drawers for even simple things like underwear and socks - perhaps nightstands with drawers could take care of that? All in all - a wonderful stay. " "This is a great getaway place for couples. Amazing views from our deck and the weather was perfect. Cozy without being cramped and enough of a kitchen to keep snacks and drinks, but not enough to make you feel like you need to cook meals. :)"
"This was our second stay at this particular home and loved it even more! The hot tub was running hot but still was able to use it a few times. Lots of stairs to the beach but we didn't mind a bit! The only thing bad I can say is the shower head is awful!! I wish vacation rentals would use fragrance free soap, lots of people have allergies. Thanks for a perfect getaway spit! We WILL be back"
"Arrived on Saturday, beautiful weather--85 and sunny-- took a walk and gathered drift wood for a night time fire. Back up the stair--nice work out--twice up and down --gets the heart rate up--The day ended with a nice bottle of wine, hot tub and then a fire on the beach with the perfect sunset. Sunday, not as hot--but 75 and a gentle breeze. Took a drive -- Fire place at night is wonderful with the sounds of the crashing waves. This was a perfect 2 night stay--it was my 5th time at this home--I love the seclusion and peaceful atmosphere perched above the Ocean. I will return soon. Chef Bell"